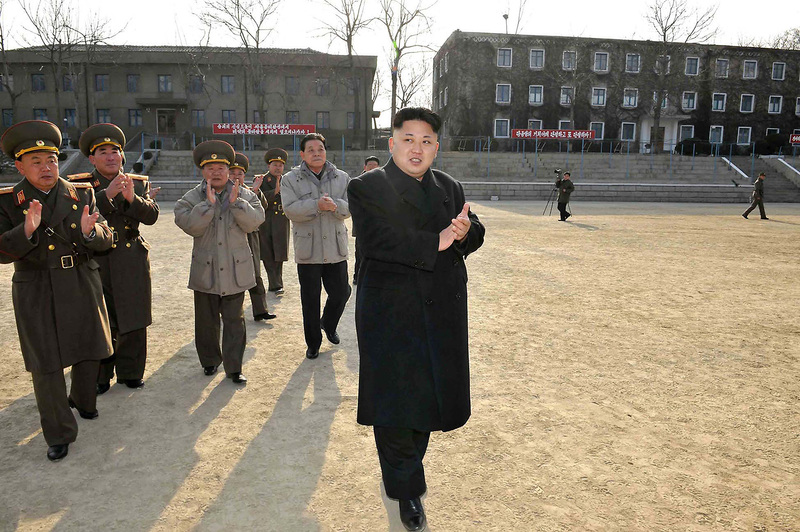 North Korean leader Kim Jong-un inspects the command of the Korean People’s Army Unit 534 in this undated photograph released by North Korea’s official Korean Central News Agency in 2014. Cornell University Press, 307 pp. Committee for Human Rights in North Korea, 119 pp. Oxford University Press, 315 pp. Committee for Human Rights in North Korea, 177 pp. This article was first published in the August 18, 2016 issue of The New York Review of Books. The pudgy cheeks and flaring hairdo of North Korea’s young ruler Kim Jong-un, his bromance with tattooed and pierced former basketball star Dennis Rodman, his boy-on-a-lark grin at missile firings, combine incongruously with the regime’s pledge to drown its enemies in a “sea of fire.” They elicit a mix of revulsion and ridicule in the West. Many predict that the Democratic People’s Republic of Korea (DPRK) cannot survive much longer, given its pervasive poverty, genocidal prison camp system identified by a U.N. commission of inquiry as committing crimes against humanity,1 self-imposed economic isolation, confrontations with all of its neighbors, and its leader’s youth and inexperience. The Obama administration has adopted a position of “strategic patience,” waiting for intensifying international sanctions to force North Korea either to give up its nuclear weapons or to implode and be taken over by the pro-Western government of South Korea. But North Korea’s other closest neighbors, the Chinese, have never expected the DPRK to surrender or collapse, and so far they have been correct. Instead of giving up its nuclear bomb and missile programs, Pyongyang is by now thought to have between 10 and 20 nuclear devices and over one thousand short-, medium-, and long-range missiles, and to be developing a compact warhead that will be able to hit the U.S. mainland. At home, the regime recently survived the toughest test that totalitarian systems face, a leadership succession. The country was ruled by Kim Il-sung from 1948, when the postwar Soviet occupation of North Korea ended, until his death in 1994; by his son, Kim Jong-il, from 1994 until he died in 2011; and since 2011 by the founder’s grandson, Kim Jong-un. Jong-un was his father’s youngest son and a surprise successor; he emerged as heir apparent only two years before his father’s death, in contrast to his father, who had been heir apparent for 20 years. Kim Jong-il is believed to have run the country’s terrorism, counterfeiting, smuggling, and proliferation operations for most of that time. In another contrast, the second Kim had staged a protracted public mourning for his father and made a show of modesty by postponing his formal takeover of top posts for three years, whereas Jong-un, only 27 years old, anointed himself as first secretary of the ruling Korean Workers’ Party (KWP) immediately upon his father’s death and before long assumed the posts of chair of the Central Military Commission, chair of the National Defense Commission, and supreme commander of the Korean People’s Army, among others. This May, he summoned the Seventh Congress of the Korean Workers’ Party, its first in 36 years, so he could accept the position of party chairman and place his personal stamp on the country’s policy of “parallel advance” (byungjin) in building both the economy and nuclear weapons. To provide for the regime’s future, Kim Il-sung made the myth that gave him personal legitimation also the basis of a new dynasty. He probably feared, as Lankov speculates, being rushed off the stage by his designated successor in the way that, for example, Lin Biao had recently been accused of doing to Mao in China. The only person unlikely to be tempted to overthrow him was his son, whose own survival would depend on the robustness of his father’s myth. The younger Kim’s birth year was altered from 1941 to 1942 to rhyme with his father’s birth year of 1912. His official birthplace was moved from its actual location in Siberia, where the Korean Communists were hiding out during the war, to a mythical secret revolutionary military camp on the snow-capped sacred Mount Paektu inside Japanese-occupied Korea. And the story of his youth was retroactively packed with demonstrations of resoluteness and virtue. As the end of his own life approached, Kim Jong-il in turn needed to find a successor among his three male offspring. (He also had four daughters, who today occupy posts of varying responsibility in the regime.) Observers had originally expected the succession to fall upon the eldest, Kim Jong-nam (born in 1971).3 Jong-nam, however, was the offspring of Jong-il’s first long-term consort (it is not clear whether Jong-il ever formally married any of his companions), whom the patriarch Kim Il-sung disliked. Moreover, in 2001, Jong-nam was caught by Japanese immigration officials entering the country on a forged Dominican passport, accompanied by a wife, child, and nanny. The forged passport was nothing unusual for North Korean elites, but apparently Jong-nam’s reason for using it—to bring his family to visit Tokyo Disneyland—confirmed in his father’s eyes that he lacked the necessary toughness to wield power. Jong-nam was sent into exile, and reportedly spends much of his time in the Chinese gambling city of Macau. He has given several press interviews expressing his disapproval of “hereditary succession.” Chinese guards, I have been told, protect him from potential North Korean assassins. It is not clear who supports him. Kim Jong-il’s second son, Kim Jong-chul, was also found inadequate, according to a gossipy book by the family’s Japanese former sushi chef, because he was too “effeminate.” That left Jong-un, born in 1984,4 although his official birthday has been adjusted to 1982 to continue the mystical parallelism with his grandfather’s and father’s birth years. Jong-un was not academically talented, and during his secondary education at a private school in Switzerland he is said to have been obsessed with basketball and other sports. But he was short-tempered and domineering, characteristics suitable for inheriting a dictatorship. In 2009, word appeared that a “new genius of leadership had emerged from within the ancient lands of Korea.” Jong-un’s appearance was groomed to resemble his grandfather’s—including his bouffant haircut. Observers speculate that he was encouraged to gain weight for this purpose; according to intelligence reports he may now be suffering from health problems related to obesity. The most serious threat to Jong-un’s authority was his uncle. The husband of Kim Jong-il’s only sister, Jang Song-taek had accumulated broad influence, serving among other things as vice-chairman of the National Defense Commission, the controller of Pyongyang’s foreign exchange resources, and the regime’s chief contact with China.5 Many viewed him as a regent, and he held a potential threat over Jong-un’s head in the form of a close relationship with the exiled older half-brother Jong-nam, who could potentially have replaced the younger sibling at the head of the party and state. On December 8, 2013, two years after Jong-un came to power, the young ruler arranged for Jang to be seized by uniformed guards in front of hundreds of high-ranking officials who had been summoned to an enlarged meeting of the ruling party’s Political Bureau. Jang was accused of “anti-party, counter-revolutionary factional acts,” of conducting numerous extramarital affairs, and of other crimes. He was denounced as “an ugly human scum worse than a dog” and executed by firing squad (not, as was rumored at the time, by antiaircraft guns or ravenous dogs). Many of his followers were killed or sent to labor camps, some reports say along with their spouses, children, and grandchildren. Jang’s wife may or may not have approved of her adulterous husband’s execution; she is said to be suffering from dementia and has appeared silently in public a handful of times since the purge. This family drama especially shocked North Korea’s only formal allies, the Chinese. They interpreted such flagrant mistreatment of their prime Pyongyang interlocutor, whom they regarded as a rational reformer, as an insult. And the purge underscored a moral difference between the two dictatorships: for all the viciousness of their politics, Chinese politicians do not execute their relatives. Since this is not a Marxist-Leninist state committed to the improvement of material living standards, but rather a nationalist one in which the leader’s main function is to embody Korean virtues—which are not seen to include intellectual brilliance anyway—the relative inferiority of [the leader’s] genius troubles propagandists less than an outsider might assume. Still, a principal function of rulers in the Kim dynastic line is to visit production units throughout the country and dispense “on-the-spot guidance.”6 How could Kim Jong-un—only a year before his father’s death appointed a four-star general and vice-chair of the Central Military Committee without any prior military experience—command the respect of the country’s one-million-strong professional armed forces, the fourth-largest in the world, or its missile scientists, trained in the USSR and China, who had managed under conditions of economic stagnation to build nuclear bombs and missiles that (more or less) work, or of the country’s senior economic planners and diplomats? To assert his control over them, Kim Jong-un purged dozens of high-ranking military officers as well as some senior party and security officials. (The Associated Press reported South Korean sources as saying that Kim executed some seventy high officials in his first four years in office.) At the same time, he promoted officials from his grandfather’s and father’s generations whom he regarded as loyal. Kim moved to consolidate support among the general public by retaining but mildly softening the regime’s society-wide system of layered deprivation. This has been examined in a pair of invaluable reports by Robert Collins, who describes how the songbun, or class status, system of North Korea “subdivides the population of the country into 51 categories or ranks of trustworthiness and loyalty to the Kim family and North Korean state.” These categories are grouped in turn into three broad castes: the core, the wavering, and the hostile classes, representing about 25 percent, 55 percent, and 20 percent of the population, respectively. The order of privilege is not only social but physical. Living in nearly first-world conditions in downtown Pyongyang are several hundred thousand top members of society. Further out but still in the city are lower-ranking cadres and experts whose conditions of life are inferior but tolerable. The mass of the population lives away from the capital. Personnel in the middle layers of privilege are afraid to question the system for fear of being demoted to layers suffering greater privation. This system generates an anxious conformity throughout society comparable to that generated by the Gulag in the Soviet Union and race exclusion in Nazi Germany. The harshness of life for the majority has been mitigated to some extent by modest economic and cultural reforms, some of which began under Kim Jong-il. The regime tolerates small-scale private markets, which improve access to food; farmers may keep part of their harvests; enterprises can distribute some of their income to workers and staff; and a limited number of traders can go back and forth across the Chinese border. The famine of the late 1990s is fading in memory. The GDP growth rate has run about 1 percent per year since Kim took office, compared to negative rates during many of his father’s years. The new leader has cultivated a stodgy kind of youth culture, represented by exhibition basketball games with the Harlem Globetrotters, a girl band playing Western pop songs and surrounded by dancers costumed as Disney cartoon characters, a glitzy new water park, and the unusual (in North Korea) public appearances at his side of his beautiful young wife, a former singer. The economy, however, still depends largely on four sources: exports to China of fishery products and minerals, often produced by prison camp inmates; the dispatch of teams of indentured laborers to Siberia, Africa, and the Middle East; the proceeds of illicit counterfeiting and smuggling; and relief aid blackmailed from South Korea and the West by the threat of starvation. In the 2000s Beijing tried to persuade Kim Jong-il to adopt Chinese-style reforms. But the elder Kim was probably right to judge that reforms on that scale would be politically suicidal. Even China almost collapsed in 1989, after the first ten years of Deng Xiaoping’s reforms. North Korea is more like East Germany than it is like China: there is another Korean regime of similar size next door that offers a more successful economic model. Even the mild opening that the Kims have allowed has produced a hunger for information, fed by legal and illegal travelers to China and by radio broadcasts and other media disseminated by the “defector” community (as it is called) in South Korea, which could lead at some point to mass resistance. To prevent this, the regime controls information by locking radio receivers to approved frequencies and engineering cell phones and computers that can access only government-controlled sites. The population remains compliant, but is unlikely to feel the adulation for Kim Jong-un that earlier generations did for his grandfather. As in East Germany, North Korean citizens would flee in unstoppable numbers if the border were open and they fully understood what was going on next door. China opposes the North Korean nuclear weapons program because it drives South Korean, Japanese, and U.S. weapons policies in a direction it dislikes (such as the recent South Korean agreement to deploy an American radar and missile defense system called THAAD) and raises the potential—although the Chinese deem it remote—of nuclear war next door and a flood of refugees. But Beijing does not regard the North Korean problem as a crisis the way Washington does, because the situation provides some benefits for China. Pyongyang’s disruptive behavior places stress on the relationships between Washington and its principal Asian allies in Tokyo and Seoul, since the three partners have different priorities in dealing with the North Korean threat. China has been able to position itself as a major diplomatic broker in the region, driving South Korea closer to it and forcing Washington to express its gratitude for whatever efforts Beijing makes to help solve the North Korean problem. Although the Chinese have never liked the Kim dynasty, they have to deal with the North Korea that exists. This June, the Chinese president Xi Jinping granted an audience to a personal envoy sent by Kim Jong-un, even though the envoy’s brief was to deliver the defiant message that Pyongyang would never give up its nuclear weapons program. Beijing sees the solution to the Korean nuclear problem as lying chiefly in Washington. As the Chinese see it, North Korean nuclear policy is an inevitable response to decades of threats from the U.S. to North Korea’s survival, precisely as Pyongyang says it is. Chinese strategists believe Pyongyang would have bargained away the nuclear program if Washington had given credible guarantees not to seek the regime’s overthrow. But although Washington has said many things along this line, the formulations were never sufficiently firm and public to be credible. Two major deals to dismantle the nuclear weapons program—in 1994 and 2005—collapsed amid mutual accusations of duplicity between Pyongyang and Washington. Now, in China’s view, it is too late to denuclearize North Korea. What Kim Jong-un wants is international recognition as a nuclear power. Eventually the U.S. will have to give it to him. The ability of the weakest power in Northeast Asia to defy all the others is nothing new. As Charles Armstrong shows in Tyranny of the Weak, Pyongyang benefited from the rivalry between China and the Soviet Union throughout the cold war by virtue of “masterful manipulation.” Relations between the Kim dynasty and its Communist patrons were even worse than the outside world suspected, yet Pyongyang kept both countries busy bidding for its support. A similar dynamic applies today, as the regime confronts the rest of the world with its ability to wreak harm both by surviving and by collapsing. Kim Jong-un has surprised the skeptics. In five years he has turned a most unpromising situation into a certain kind of success. He has refuted those at home and abroad who doubted his vigilance and ruthlessness, fostered a mild economic recovery, and advanced his country’s position as a nuclear power. U.N. sanctions have been calibrated at China’s behest so as not to threaten the regime’s survival. If Kim’s economy were to falter, China and South Korea would have to bail him out. The only risk of collapse would be if young Kim’s health declined. Even then, the strong, disciplined army, with its privileges at stake, would maintain order. China would be the beneficiary, which is one reason that Beijing sees no need for the discussions about contingency plans that many Western strategists call for. This is, however, a poor kind of victory, with the young ruler and his countrymen trapped in a self-sustaining nightmare that shows no prospect of ending.